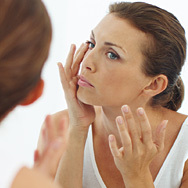 Sun damage can lead not only to puffy eyes, but also to dark circles! The solution is simple: Use a product rated SPF 30 or higher around your eye area every day (rain or shine), and wear sunglasses whenever you’re outdoors. You might be surprised at how much this helps. Another way to improve the appearance of puffiness is simply to be gentle to the skin around your eyes. Use fragrance-free products, make sure you remove any makeup in the eye area at the end of the day, and avoid harsh, sensitizing ingredients. To help replenish skin in that area, dab on a rich, balm-like eye cream loaded with proven anti-aging and nourishing ingredients.